I'm just going to do a quick post for now, but I wanted to say we had some better success with the Strawberry flavor. 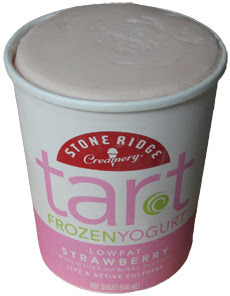 It reminds me a lot of the Stonyfield farm strawberry yogurt my wife usually eats. I mean, I don't think I would buy this on purpose, but it's still respectable stuff and my daughter had no problem finishing her bowl's worth. just tried this and it is AWESOME, it is creamy and TART at the same time. LOVE IT, I hope they come out with a chocolate flavor or a coffee one. If you are watching your figure or NOT, this is highly recommended.